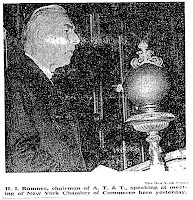 This New York Times article from 1968 quotes the chairman of AT&T and his expectations about the future of Picturephones. "'I think for example that Picturephone service will be in very considerable use within less than ten years,' Mr. Romnes said. 'By this I mean person-to-person connections, over a switched network and similar connections between people and computers, with the output of the computers shown on the Picturephone screen.'" Picture-phones have been the promise of many generations now. (As we saw with the 1993 AT&T ads from last week.) When it really comes down to it, will the picture-phone ever seem practical given our mobile lifestyles? Is it time to put the picturephone in the permanent collection of the Paleo-Future Museum? If you have a TimesSelect subscription you can read the entire article here. What about video conferencing and more recently the explosion of video chat with things like AIM and MSN Messenger becoming more prominent and Apple building cameras right into the laptops? It might not exactly be a Picture Phone but the idea is still there and I think gaining momentum.